In the digital age we are living in, Business owners, institutions, organizations or project purpose establishments usually require software and as well as hardware and work plan models. So, in accordance with these needs, there developed various kinds of project management methods. Each having their own characteristics, roles, tasks and time management methods. The classical method is waterfall project management. Despite the fact that it does not have a method for time efficiency, the waterfall method has the preliminary attempts to handle and manage tasks to reach for a certain end. The above project is an example of a waterfall. So first, the project team determines the feasibility of the project, this is the stage they decide to take on it or not. This part seems ok, however, the second part is ‘to plan’. Things get a little bit complicated at this stage. Well, more or less, you have to decide and set up everything beforehand. This means that the project must first be planned before it is designed. Just like this, the project team is not able to pass on the other stage before completing the stage they are in. Scrum project, on the other hand, comprises flexibility. It is composed of spirits which make up a two weeks process for the completion of the product by The Team. The Team is composed of specialists and experts in their fields but in Scrum Project Management, it doesn’t necessarily mean that they are only responsible for one task. This implies that every member of the team should also be responsible for project management itself. They are cross-sectional. The team must create a sprint backlog in which they will assign themselves to clear tasks. The sprint backlog, in turn, must correspond to product backlog which is composed of the priorities set by the product owner. When to prefer Scrum Project Management? Scrum project management is good for continuous development. This usually depends on the expectations of the product owner. If the product owner demands a specific and well-defined vision of his/her product, then, the Scrum method for project management is not preferable. This usually happens when the product is already well-developed, working or only have some complaints from affected third or fourth parties or just has some issues to be fixed. However, when the product is the result of a brand new idea etc., the product owner wants the development to be continuous and he/she will acknowledge the possibility that it is going to get better through processes and time. The most important feature of scum project management is its agility and flexibility. In addition, scrum project management is constituted of many spirit parts. Each spirit contains four processes: Plan, Build, Test and, Review. At the end of each spirit, there occurs a potentially shippable product. There is also one more role which is not mentioned above. The Scrum Master, who communicates with the product owner and ensures whether the shippable product is qualified enough so that customer satisfaction is guaranteed. There is a similar method to scrum project management and that is kanban project management. One needs the Kanban method for the same reasons as the scrum. However, in the Kanban method, The Team does not review the project undertakings within the incremental period of every two weeks. See more from here, for the difference between Kanban and Scrum. SCRUM is a framework that facilitates team collaboration on complex projects. 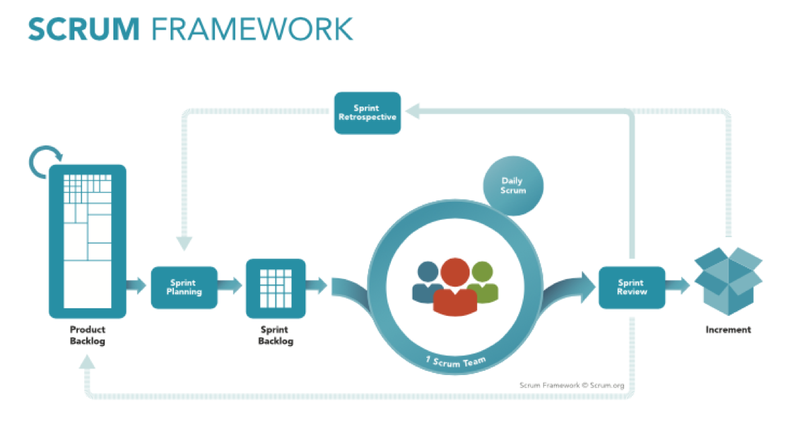 In software development, the SCRUM framework enhances the implementation of the AGILE process. The SCRUM methodology is iterative, incremental, and reactive. The process reacts to conditions on the fly rather taking action based on projected assumptions. This is the key stakeholder. It is usually an external client or a spokesperson for the client. He or she conveys the product’s vision and mission to the team. The owner is ultimately in charge of approving the complete increments of work. This is the product owner’s servant and the development team’s leader. That said, his or her leadership is not in the hierarchical sense. The SCRUM master is more of a facilitator whose main role is to ensure the team always performs at the highest levels of productivity. The development team comprises of all the people that play any role in the realization of a deliverable increment. This group is cross-functional and self-organized with no defined leadership roles. 1. The Product Backlog: The product owner makes a list of the work to be done- product backlog- and sorts it out in order of priority. Prioritizing the tasks is at the owner’s discretion. 2. Sprint Planning: A sprint is a short period of time in which specific objectives must be met. The development team uses the product backlog to determine the best way to achieve the highest priority goals first. 3. The Sprint: A sprint is usually anywhere between two-to-four weeks. There are daily SCRUM meetings through the entire period to ensure the sprint is on track. During the meetings, transparency is key. In fact, the entire framework relies heavily on transparency and the free flow of information. 4. The SCRUM Master’s Oversight: The SCRUM master is master in name only. He or she is a SCRUM specialist who plays a very crucial advisory role to the development team. Their experience and skills are welcome additions to the variety of skills and know-how already present in the development team. 5. Sprint Completion: Sprints are complete when they are ready for delivery. Regression tests should be done to avail much-needed learning opportunities. 6. Review: After every sprint, you will undoubtedly identify positives and negatives in the process. The review provides an opportunity for improving the process. The focus is on replicating what worked and modifying or doing away with what did not work. 7. Repeat: After the review, it is time to repeat the cycle. The team goes back to the backlog and identifies the next high-priority task. The lessons learned in every sprint are used to improve the next cycle. SCRUM rules are not set on stone. Each team should modify the process appropriately to fit their specific needs.